Great place! We booked 2 night and finally we stayed 11 days. Gusti and Ari are really nice and they were always trying to help us. The breakfast that Ari makes is amazing and different every day. They have a Restaurant in the front as well and the food is delicious and cheap. Definitely we recommend this place and we wish we will come back. All the best for them! Really enjoyed my stay here. Such amazing value for money! Very fast WiFi, cheap motorbike rental, free drinking water was a big one for me as I am an eco traveller and it saves me going out to buy water. Free breakfast. It is a beautiful and peaceful neighbourhood. There is a communal fridge and freezer for keeping the water cold and a kitchen to use if you want to cook your own meals. Gusto was very hospitable and helpful during my stay and made me feel comfortable. Highly recommended! 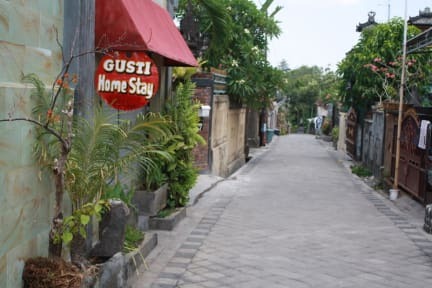 I'd definitely recommend this to anyone looking for affordable accommodation in a good location in Bali! Really great atmosphere and Gusti and his team couldn't have been nicer! At first, I was skeptical about the place and was intended to cancel and I am glad I didn't. The house is old and the owner has tried to keep it clean. The private room is spacious and roomy , the bed is comfortable. The owner is very nice and helpful, His staff are friendly. I would stay here again if I ever come back again. Good location a bit outside the tumult of Canggu, where you can get in 20mn by motorbike. Lockers, kitchen, very nice and helpful staff. I definitely recommend! Very friendly, speak very well english, understand and help you when you have problems! Tasty and good value food. Good scooter's. Very clean. Nice firm mattresses not worn in ! I can highly recommend to stay here if you want to stay in this area. Free breakfast, water, tea and coffee is such a good bonus. Location is a little out of town but scooters are available and only 50,000 IDR. 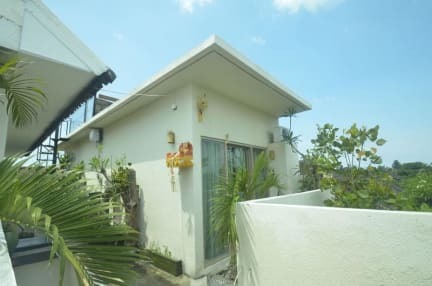 The dorm is a little basic, shower alternated between hot and cold but the staff are super friendly and so hospitable. We loved our stay.